cary conover - blog: Notes from "The Legacy of Henri Cartier-Bresson"
The discussion began by a retelling of a debate that had taken place earlier between Galassi and Chevrier, about whether HCB was better known as historian or an artist. My recollection is that Galassi leaned toward HCB as a historian, Chevrier towards him as an artist. This lead into a discussion about the 'use' of images and the difference between a good illustration (magazine) vs good picture (wall). A discussion about HCB's early work, which fell into the latter category of "good pictures." Showed Rolleiflex picture of shirt hanging on a wire. Prime example of the former was HCB picture from Jakarta, 1949, of men removing the paintings of Dutch governors from the Governor's residence on the day before independence. Good example of an image that illustrated idea, of a photo accompanied by text. All summed up by the "world within" vs "the other." There were a LOT of tangents. Two Frenchman, debating HCB, there were a lot of "statements made in parentheses" At one point, discussing the slight nuances between two similar ideas, GP quips "Where's the whiskey?" GP at one point early on states that the only reason he was doing this was to pay back the many generous moments HCB offered him, HCB's advice to him long ago, etc. He suggested that later in his life HCB had come to terms about how he had been a "good soldier," traveling often and taking assignments. His words to GP were, "You don't own them [the magazines] anything other than the pictures on time." Situation with Algeria perhaps the reason he never returned. Still unsolved for France. The "cult" of Cartier-Bresson in the 1980s, people who dressed like him, carried their cameras around their wrists, wore the tweed jacket, etc. The "choir boys" in Magnum who tried to please HCB. Robert Delpire - very "graphical in intent" (according to Jean-Francois) when designing HCB books throughout the 80s. Jean-Francois discussed his frustration of not getting access to HCB's work (why inaccessible?). On one hand Jean-Francois said there was "The institutionalization of the great work of the photographer in France (HCB)" vs "the inaccessibility to the work." Apparently, HCB told Martine Franck early on in their relationship (PARAPHRASED) "If you want to know why I am the way I am, you must read Proust." 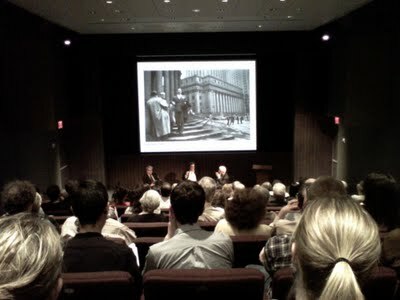 Discussion of Walker Evans "American Photographs" vs "Many Are Called." Jean-Francois essentially said that even HCB's landmark books never quite reached the level either of these two of Evans' books. This lead to a discussion of HCB's endless travels vs Evans working near his home. GP: HCB had a "quicksilver" quality. He refers to the way HCB would start a sentence and then by the time he'd finished the sentence have already come up with a wonderful contradiction to himself. GP said something to the effect of (PARAPHRASED) "Later in his career, HCB had retreated to the edges of his pictures." HCB's "castle" was his black frame, full frame prints, the exactitude of his captions. GP refers to certain shots of HCB's as "mousetrap" shots, shots in which HCB would frame a scene and then wait for somebody to enter. Girl walking up steps in Cyclades, Greece in 1961 and the 1932 shot of the biker whizzing by in Hyéres, France. Portraits he made throughout his career, it was a constant. GP says it spoke a lot to the wonderful humanity of HCB. Said he utilized a wide variety of tactics in shooting these portraits, mentioning how he photographed the couple Irene and Frederic Joliot-Curie, 1945. Immediately as they opened the door to greet him he instinctively snapped the famous shot (which somebody once described as having a "dank, gothic grayness"). In others he utilized great patience (famous shot of Ezra Pound, 1971). At the very end of the discussion, GP talks about HCB's patience and remembers how HCB would be trying to get a shot of him at an AGM or something, arguing a point, talking with other photographers, etc. GP was very aware that he was being photographed and would do everything possible to avoid it. But then 30 minutes later after he'd forgotten about it he'd hear the click of HCB's camera. Hi, Cary. Very nice writing here. HCB sounds like he was really quite a character with quite the personality. I'll be eager to see his exhibition at MOMA and your piece leaves me well prepared to take it in properly. Gonna go take some mouse trap shots now.